A routine round of golf for Kerry Everett in his Wednesday men’s league at Temecula Creek Inn in April turned into something rare and special when his second shot on a par-5 found the bottom of the cup for a double eagle. Everett’s rare feat occurred on the dogleg right 519-yard par-5 7th on the Oak nine. After a solid drive, Everett’s rescue from 220 yards found the hole, much to his surprise and his group. Shielded from a view of the green by trees, no one saw the ball go in, Everett said. The shot was the highlight of round where Everett, a 4 handicap, shot 68. A double eagle, also known an albatross, is considered the rarest shot in golf because it takes toward good swings as opposed to just one for a hole-in-one. Golf Digest pegs the odds of a hole-in-one for an amateur at 12,500 to 1. It hasn’t established the odds for a double eagle with such mathematical certainly. Or at least a Google search on the topic was inconclusive. Whatever the math, Everett takes it to another level because this was his second double eagle. He scored one in Laughlin, Nev., 10 years ago, he says, when he wasn’t taking the game as seriously as he has the past seven. Shortly after scoring his second double eagle, Everett says the irony quickly occurred to him of what he’d accomplished without ever having a hole-in-one. Everett lives in Temecula and has been playing in his men’s league for a year. He regards Temecula Creek Inn as his home course and says he appreciates the challenge of the layout and the quality of the course conditions. 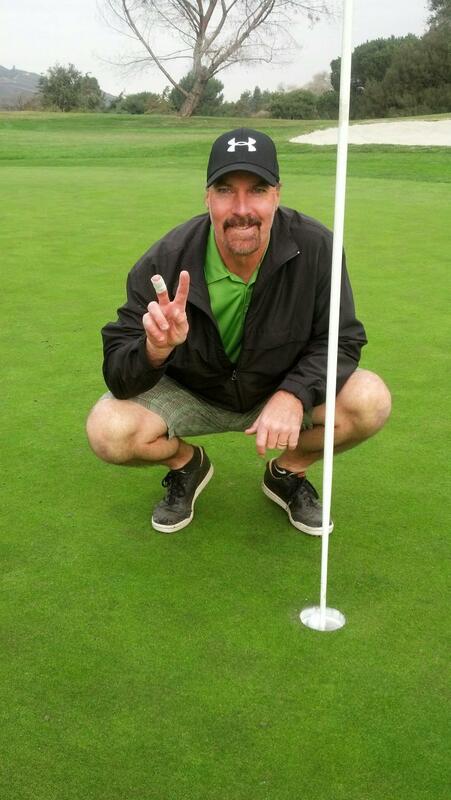 This entry was tagged double eagle, kerry everett, par-5, temecula creek inn. Bookmark the permalink.